For the electrical device, see Transformer. For other uses, see Transformers (disambiguation). It has been suggested that Transformers (toy line) be merged into this article. (Discuss) Proposed since August 2018. Transformers (Japanese: トランスフォーマー, Hepburn: Toransufōmā) is a Japanese–American media franchise, produced by Japanese toy company Takara Tomy and American toy company Hasbro. Initially a line of transforming mecha toys rebranded from Takara's Diaclone and Microman toylines, the franchise began in 1984 with the Transformers toy line, and centers on factions of self-configuring modular extraterrestrial robotic lifeforms (often the Autobots and the Decepticons) in an endless civil war for dominance or eventual peace. In its history, the Transformers robot superhero franchise has expanded to encompass comic books, animation, video games and films. Beast Wars II: Lio Convoy, Close Call! The term "Generation 1" covers both the animated television series The Transformers and the comic book series of the same name, which are further divided into Japanese and British spin-offs, respectively. Sequels followed, such as the Generation 2 comic book and Beast Wars TV series, which became its own mini-universe. Generation 1 characters underwent two reboots with Dreamwave in 2001 and IDW Publishing in 2005, also as a remastered series, with a third starting in 2019. There have been other incarnations of the story based on different toy lines during and after the 20th century. The first was the Robots in Disguise series, followed by three shows (Armada, Energon, and Cybertron) that constitute a single universe called the "Unicron Trilogy". A live-action film series started in 2007, again distinct from previous incarnations, while the Transformers: Animated series merged concepts from the G1 continuity, the 2007 live-action film and the "Unicron Trilogy". For most of the 2010s, in an attempt to mitigate the wave of reboots, the Aligned continuity was established. In 2018, Transformers: Cyberverse debuted, once again, distinct from the previous incarnations. Although initially a separate and competing franchise started in 1983, Tonka's Gobots became the intellectual property of Hasbro after their buyout of Tonka in 1991. Subsequently, the universe depicted in the animated series Challenge of the GoBots and follow-up film GoBots: Battle of the Rock Lords was retroactively established as an alternate universe within the Transformers robot superhero franchise. Generation One is a retroactive term for the Transformers characters that appeared between 1984 and 1993. The Transformers began with the 1980s Japanese toy lines Microman and Diaclone. The former utilized varying humanoid-type figures while the latter presented robots able to transform into everyday vehicles, electronic items or weapons. Hasbro, fresh from the success of the G.I. Joe: A Real American Hero toyline, which used the Microman technology to great success, bought the Diaclone toys, and partnered with Takara. Jim Shooter and Dennis O'Neil were hired by Hasbro to create the backstory; O'Neil also created the name "Optimus Prime." Afterwards, Bob Budiansky created most of the Transformers characters, giving names and personalities to many unnamed Diaclone figures. The primary concept of Generation One is that the heroic Optimus Prime, the villainous Megatron, and their finest soldiers crash land on pre-historic Earth in the Ark and the Nemesis before awakening in 1985, Cybertron hurtling through the Neutral zone as an effect of the war. The Marvel comic was originally part of the main Marvel Universe, with appearances from Spider-Man and Nick Fury, plus some cameos, as well as a visit to the Savage Land. The Transformers TV series began around the same time. Produced by Sunbow Productions and Marvel Productions, later Hasbro Productions, from the start it contradicted Budiansky's backstories. The TV series shows the Autobots looking for new energy sources, and crash landing as the Decepticons attack. Marvel interpreted the Autobots as destroying a rogue asteroid approaching Cybertron. Shockwave is loyal to Megatron in the TV series, keeping Cybertron in a stalemate during his absence, but in the comic book he attempts to take command of the Decepticons. The TV series would also differ wildly from the origins Budiansky had created for the Dinobots, the Decepticon turned Autobot Jetfire (known as Skyfire on TV), the Constructicons (who combine to form Devastator), and Omega Supreme. The Marvel comic establishes early on that Prime wields the Creation Matrix, which gives life to machines. In the second season, the two-part episode The Key to Vector Sigma introduced the ancient Vector Sigma computer, which served the same original purpose as the Creation Matrix (giving life to Transformers), and its guardian Alpha Trion. In 1986, the cartoon became the film The Transformers: The Movie, which is set in the year 2005. It introduced the Matrix as the "Autobot Matrix of Leadership", as a fatally wounded Prime gives it to Ultra Magnus; however, as Prime dies he drops the matrix, which is then caught by Hot Rod who subsequently becomes Rodimus Prime later on in the film. Unicron, a transformer who devours planets, fears its power and recreates a heavily damaged Megatron as Galvatron, as well as Bombshell or Skywarp becoming Cyclonus, Thundercracker becoming Scourge and two other Insecticons becoming Scourge's huntsmen, the Sweeps. Eventually, Rodimus Prime takes out the Matrix and destroys Unicron. In the United Kingdom, the weekly comic book interspliced original material to keep up with U.S. reprints, and The Movie provided much new material. Writer Simon Furman proceeded to expand the continuity with movie spin-offs involving the time travelling Galvatron. The Movie also featured guest voices from Leonard Nimoy as Galvatron, Scatman Crothers as Jazz, Casey Kasem as Cliffjumper, Orson Welles as Unicron and Eric Idle as the leader of the Junkions (Wreck-Gar, though unnamed in the movie). The Transformers theme tune for the film was performed by Lion with "Weird Al" Yankovic adding a song to the soundtrack. The third season followed up The Movie, with the revelation of the Quintessons having used Cybertron as a factory. Their robots rebel, and in time the workers become the Autobots and the soldiers become the Decepticons. (Note: This appears to contradict background presented in the first two seasons of the series.) It is the Autobots who develop transformation. Due to popular demand, Optimus Prime is resurrected at the conclusion of the third season, and the series ended with a three-episode story arc. However, the Japanese broadcast of the series was supplemented with a newly produced OVA, Scramble City, before creating entirely new series to continue the storyline, ignoring the 1987 end of the American series. The extended Japanese run consisted of The Headmasters, Super-God Masterforce, Victory and Zone, then in illustrated magazine form as Battlestars: Return of Convoy and Operation: Combination. Just as the TV series was wrapping up, Marvel continued to expand its continuity. It followed The Movie's example by killing Prime and Megatron, albeit in the present day. Dinobot leader Grimlock takes over as Autobot leader. There was a G.I. Joe crossover and the limited series The Transformers: Headmasters, which further expanded the scope to the planet Nebulon. It led on to the main title resurrecting Prime as a Powermaster. In the United Kingdom, the mythology continued to grow. Primus was introduced as the creator of the Transformers, to serve his material body that is planet Cybertron and fight his nemesis Unicron. Female Autobot Arcee also appeared, despite the comic book stating the Transformers had no concept of gender, with her backstory of being built by the Autobots to quell human accusations of sexism. Soundwave, Megatron's second-in-command, also broke the fourth wall in the letters page, criticising the cartoon continuity as an inaccurate representation of history. The UK also had a crossover in Action Force, the UK counterpart to G.I. Joe. The comic book featured a resurrected Megatron, whom Furman retconned to be a clone when he took over the U.S. comic book, which depicted Megatron as still dead. The U.S. comic would last for 80 issues until 1991, and the UK comic lasted 332 issues and several annuals, until it was replaced as Dreamwave Productions, later in the 20th-Century. In 2009, Shout! Factory released the entire G1 series in a 16-DVD box set called the Matrix of Leadership Edition. They also released the same content as individual seasons. It was five issues of the G.I. Joe comic in 1993 that would springboard a return for Marvel's Transformers, with the new twelve-issue series Transformers: Generation 2, to market a new toy line. This story revealed that the Transformers originally breed asexually, though it is stopped by Primus as it produced the evil Swarm. A new empire, neither Autobot nor Decepticon, is bringing it back, however. Though the year-long arc wrapped itself up with an alliance between Optimus Prime and Megatron, the final panel introduced the Liege Maximo, ancestor of the Decepticons. This minor cliffhanger was not resolved until 2001 and 2002's Transforce convention when writer Simon Furman concluded his story in the exclusive novella Alignment. The story focused on a small group of Maximals (the new Autobots), led by Optimus Primal, and Predacons, led by Megatron, 300 years after the "Great War". After a dangerous pursuit through transwarp space, both the Maximal and Predacon factions end up crash landing on a primitive, uncivilized planet similar to Earth, but with two moons and a dangerous level of Energon (which is later revealed to be prehistoric Earth with an artificial second moon, taking place sometime during the 4 million year period in which the Autobots and Decepticons were in suspended animation from the first episode of the original Transformers cartoon), which forces them to take organic beast forms in order to function without going into stasis lock. After writing this first episode, Bob Forward and Larry DiTillio learned of the G1 Transformers, and began to use elements of it as a historical backstory to their scripts, establishing Beast Wars as a part of the Generation 1 universe through numerous callbacks to both the cartoon and Marvel comic. By the end of the first season, the second moon and the Energon are revealed to have been constructed by a mysterious alien race known as the Vok. Beast Wars Megatron attacks Optimus Prime in a clash of generations. The destruction of the second moon releases mysterious energies that make some of the characters "transmetal" and the planet is revealed to be prehistoric Earth, leading to the discovery of the Ark. 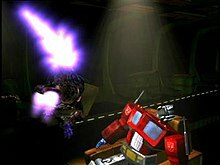 Megatron attempts to kill the original Optimus Prime, but at the beginning of the third season, Primal manages to preserve his spark. In the two-season follow-up series, Beast Machines, Cybertron is revealed to have organic origins, which Megatron attempts to stamp out. Beast Wars contained elements from both the G1 cartoon series and comics. Attributes taken from the cartoon include Transformers that were female, the appearance of Starscream (who mentions being killed off by Galvatron in The Transformers: The Movie), and appearances of the Plasma Energy Chamber and Key to Vector Sigma. The naming of the Transformer ship, the "Ark" (and reference to 1984, the year the Transformers on board were revived) and the character, Ravage being shown as intelligent, and Cybertron having an organic core were elements taken from the comics. In 2011, Shout! Factory released the complete series of Beast Wars on DVD. In 2001, Dreamwave Productions began a new universe of annual comics adapted from Marvel, but also included elements of the animated. The Dreamwave stories followed the concept of the Autobots defeating the Decepticons on Earth, but their 1997 return journey to Cybertron on the Ark II is destroyed by Shockwave, now ruler of the planet. The story follows on from there, and was told in two six-issue limited series, then a ten-issue ongoing series. The series also added extra complexities such as not all Transformers believing in the existence of Primus, corruption in the Cybertronian government that first lead Megatron to begin his war and Earth having an unknown relevance to Cybertron. Three Transformers: The War Within limited series were also published. These are set at the beginning of the Great War, and identify Prime as once being a clerk named Optronix. Beast Wars was also retroactively stated as the future of this continuity, with the profile series More than Meets the Eye showing the Predacon Megatron looking at historical files detailing Dreamwave's characters and taking his name from the original Megatron. In 2004, this real life universe also inspired three novels and a Dorling Kindersley guide, which focused on Dreamwave as the "true" continuity when discussing in-universe elements of the characters. In a new twist, Primus and Unicron are siblings, formerly a being known as The One. Transformers: Micromasters, set after the Ark's disappearance, was also published. The real life universe was disrupted when Dreamwave went bankrupt in 2005. This left the Generation One story hanging and the third volume of The War Within half finished. Plans for a comic book set between Beast Wars and Beast Machines were also left unrealized. Throughout the years, the G1 characters have also starred in crossovers with fellow Hasbro property G.I. Joe, but whereas those crossovers published by Marvel were in continuity with their larger storyline, those released by Dreamwave and G.I. Joe publisher Devil's Due Publishing occupy their own separate real life universes. In Devil's Due, the terrorist organization Cobra is responsible for finding and reactivating the Transformers. Dreamwave's version reimagines the familiar G1 and G.I. Joe characters in a World War II setting, and a second limited series was released set in the present day, though Dreamwave's bankruptcy meant it was cancelled after a single issue. Devil's Due had Cobra re-engineer the Transformers to turn into familiar Cobra vehicles, and released further mini-series that sent the characters travelling through time, battling Serpentor and being faced with the combined menace of Cobra-La and Unicron. During this time, Cobra teams up with the Decepticons. IDW Publishing has expressed interest in their own crossover. The following year, IDW Publishing rebooted the G1 series from scratch within various limited series and one shots. This allowed long-time writer of Marvel and Dreamwave comics, Simon Furman to create his own universe without continuity hindrance, similar to Ultimate Marvel. 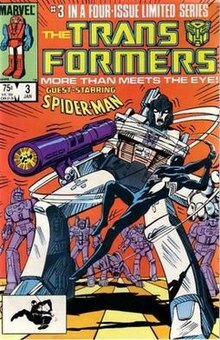 This new continuity originally consisted of a comic book series titled The Transformers with a companion series known as The Transformers: Spotlight. The main series was broken up into several story arcs. Eventually, with IDW Publishing displeased with the format, the series was given two soft reboots. The first one sped up the story, while the second ditched the mini series format as well as the Spotlight series. Finally, the series was broken into three, becoming The Transformers: More Than Meets The Eyes, The Transformers: Robots in Disguise (now simply The Transformers) and The returning The Transformers - Spotlight. In January 2006, the Hasbro Transformers Collectors' Club comic wrote a story based on the Transformers Classics toy line, set in the Marvel Comics universe, but excluding the Generation 2 comic. Fifteen years after Megatron crash lands in the Ark with Ratchet, the war continues with the characters in their Classics bodies. IDW Publishing introduced The Transformers: Evolutions in 2006, a collection of mini-series that re-imagine and reinterpret the G1 characters in various ways. To date, only one miniseries has been published, Hearts of Steel, placing the characters in an Industrial Revolution-era setting. The series was delayed as Hasbro did not want to confuse newcomers with too many fictional universes before the release of the live-action film. However, IDW and the original publisher Marvel Comics announced a crossover storyline with the Avengers to coincide with the film New Avengers/Transformers. The story is set on the borders of Symkaria and Latveria, and its fictional universe is set between the first two New Avengers storylines, as well in between the Infiltration and Escalation phase of IDW's The Transformers. IDW editor-in-chief, Chris Ryall hinted at elements of it being carried over into the main continuities, and that a sequel is possible. In June 2018 it was announced there would be Star Trek and Transformers Crossover being released in September 2018. First broadcast in Japan in 2000, Robots in Disguise was a single animated series consisting of thirty-nine episodes. It was exported to other countries in subsequent years. In this continuity, Megatron recreates the Decepticons as a subfaction of the Predacons on Earth, a potential reference to the return to the vehicle-based characters following the previous dominance of the animal-based characters of the Beast eras. It is a stand-alone universe with no ties to any other Transformers fiction, though some of the characters from Robots in Disguise did eventually make appearances in Transformers: Universe, including Optimus Prime, Ultra Magnus, Side Burn and Prowl. The show was heavily censored in the U.S. due to its content of buildings being destroyed and terrorism references after the 9/11 attacks on the World Trade Centers. The show was eventually banned from cable TV networks in the U.S. These three lines, launched in 2002 and dubbed the "Unicron Trilogy" by Transformers designer Aaron Archer, are co-productions between Takara and (lesser extent) Hasbro, simultaneously released in both countries, each lasting 52 episodes. Armada followed the Autobots and Decepticons discovering the powerful Mini-Cons on Earth, which are revealed by the end to be weapons of Unicron. Energon, set ten years later, followed the Autobots and the Omnicons in their fight to stop the Decepticons and the Terrorcons from resurrecting Unicron with energon. Just as Marvel produced a companion comic to Generation One, Dreamwave Productions published the comic Transformers Armada set in a different continuity to the cartoon. At #19, it became Transformers Energon. Dreamwave went bankrupt and ceased all publications before the storyline could be completed at #30. However, the Transformers Fan Club published a few stories set in the Cybertron era. The storyline of Transformers: Universe, mainly set following Beast Machines, sees characters from many assorted alternate continuities, including existing and new ones, encountering each other. The story was told in an unfinished comic book exclusive to the Official Transformers Collectors' Convention. In 2007, Michael Bay directed a live-action film based on Transformers, with Steven Spielberg serving as executive producer. It stars Shia LaBeouf, Josh Duhamel, Megan Fox, and Tyrese Gibson in the lead human cast while voice actors Peter Cullen and Hugo Weaving voice Optimus Prime and Megatron, respectively. Transformers received mixed to positive reviews and was a box office success. It is the forty-fifth highest-grossing film and the fifth highest-grossing film of 2007, grossing approximately $709 million worldwide. The film won four awards from the Visual Effects Society and was nominated for three Academy Awards, for Best Sound Editing, Best Sound Mixing, and Best Visual Effects. The performance of Shia Labeouf was praised by Empire, and Peter Cullen's reprisal of Optimus Prime from the 1980s was well received by fans. A sequel, Transformers: Revenge of the Fallen, was released on June 24, 2009. Despite mostly negative reviews, it was a commercial success and grossed more than its predecessor. A third film, Transformers: Dark of the Moon, was released on June 29, 2011, in 3-D and went on to gross over $1 billion, despite receiving mixed reviews. A fourth film, Transformers: Age of Extinction, was released on June 27, 2014, which also grossed over $1 billion, though it got mixed to negative reviews. A fifth film, Transformers: The Last Knight was released on June 23, 2017. Bumblebee was released in December 21, 2018, serving as a prequel to the first film. Transformers: Animated is a cartoon that was aired in early 2008 on Cartoon Network in the United States. Originally scheduled for late after 2007 under the title of Transformers: Heroes, Transformers Animated is set in 2050 Detroit (after crash landing 50 years earlier), when robots and humans live side-by-side. The Autobots come to Earth and assume superhero roles, battling evil humans with the Decepticons having a smaller role until Megatron resurfaces. Main characters include Autobots Optimus Prime, Bumblebee, Bulkhead, Prowl, and Ratchet; Decepticons Megatron, Starscream, Blitzwing, Lugnut, and Blackarachnia; and humans Professor Sumdac and Sari Sumdac. Several characters that were in the original Transformers cartoon and 1986 animated movie, as well as characters only seen in comics and such, make special appearances and cameos throughout the show, with various voice actors (including Corey Burton, John Moschitta, Jr., Susan Blu, and Judd Nelson) reprising their roles. In 2010, Hasbro released a toy line expansion to the film universe. This line is simply branded as Transformers and contains a promotion called "Hunt for the Decepticons". The promotion consists of a code number which collectors use to access online games on Transformers.com. The toy line consists of redecos and remolds of existing movie characters, as well as new versions of characters from Generation 1 and Generation 2. Highlights in this toy line include the Leader Class Starscream, Battle Ops Bumblebee and all-new more movie accurate redesigns of the Voyager Class Optimus Prime and Deluxe Class Bumblebee. Hasbro, in an attempt to stop the wave of reboots that started in 2001, created the Aligned universe, with the intent to unify every Transformers media into one continuity. The name of this continuity, however is not official; it was adopted by the fans after Hasbro referred to it as an "aligned continuity". It consists of two novels, several video games, and a few animated series, along with supplemental material. Despite being set by a brand bible of 354 pages titled "The Binder of Revelation", the video games, novels and television series notably contradicted with each other due to creative differences, miscommunications, constant team changes, and Aaron Archer being replaced with a different person that had no knowledge of the brand bible. Produced by Boulder Media Limited, Hasbro Studios and Allspark Animation for Cartoon Network, it started airing on September 1, 2018. Two seasons, named "Chapters", were planned, with the first aired in 2018 and with the second, subtitled Power of the Spark, planned for 2019. Cyberverse uses characters and elements across G1, Beast Era, the live-action film series, Animated, and the Aligned continuity. It is notable for being the first television series of the franchise to have an 11 minute runtime (the latter two installments of the Prime Wars Trilogy have first utilized this format) and for having a New York cast instead of the usual Los Angeles one. An officially recognized fan convention (usually called BotCon) has been held nearly every year since 1994. The first few conventions were organized by individual fans, but a fan-made company named 3H Enterprises (later changed to 3H Productions) secured the license to BotCon from 1997 to 2002. The license was secured by a new organization named Fun Publications in 2005, who held it until 2016 after which Hasbro reclaimed the licence as part of a strategy to merge many of its media franchises (including G.I. Joe, M.A.S.K., Rom the Space Knight, Micronauts and Visionaires into a single universe. Because the conventions are officially sanctioned by Hasbro, presenters have been able to produce official, limited-run toys, fiction, and other merchandise for sale at BotCon. The BotCon toys have grown dramatically over the years. In 1994, a single figure was provided for attendees. In 2010, fifteen different figures were available through a collection of box sets, souvenir packages, and customization classes. Fictional contributions have also increased over the years. Prior to 2005, most conventions released a single comic, often accompanying the toys released that year. Since Fun Publications assumed the license, however, the annual BotCon comic has been supplemented by on-line text stories available exclusively at the official club website, and a bi-monthly magazine sent out to members with a six-page comic in each issue. Grouped under the umbrella term "Transformers: Timelines", Fun Publications fiction deals with a variety of existing Transformers franchises, including Generation 1, Beast Wars and Cybertron, as well as new universes created specifically by Fun Publications such as TransTech and Shattered Glass. It was announced in 2016 that Fun Publications would no longer run the Transformers or G.I. Joe conventions; instead Hasbro would announce a new convention, HASCON, that would feature all of its licensed properties. ^ "The History of Transformers on TV". IGN. Retrieved 2010-08-16. ^ Sorenson, Jim; Forster, Bill (July 13, 2010). Transformers Animated: The AllSpark Almanac II. IDW Publishing. ISBN 978-1600106835. ^ "Hasbro Publishes Transformers Timeline to Movie". TFormers. 2007-02-09. Retrieved 2007-02-10. ^ Matthew Karpowich (2004-07-26). "A Little Q&A With Bob Budiansky". ASM. Archived from the original on 2008-02-21. Retrieved 2007-02-08. ^ "Bob Budiansky". TransFans.net. September 2006. Archived from the original on 2007-03-09. Retrieved 2007-02-08. ^ "More than Meets the Eye". The Transformers. 1984-09-17. ^ "Transport to Oblivion". The Transformers. 1984-10-06. ^ "S.O.S. Dinobots". The Transformers. Season 1. 1984-10-27. ^ "Fire in the Sky". The Transformers. 1984-12-08. ^ a b "The Secret of Omega Supreme". The Transformers. 1985-11-06. ^ "The Transformers: The Movie (1986)". The Internet Movie Database. Retrieved 2007-02-02. ^ James Roberts. "The Rise and Fall of Transformers UK". The Underbase. Retrieved 2007-02-16. ^ "Five Faces of Darkness — Part 4". The Transformers. 1986-09-18. ^ Lane Crockett (1987-03-28). "Hasbro Can't Toy with Optimus Prime". The Shreveport Times. Archived from the original on 2006-08-13. Retrieved 2007-02-06. ^ "The Return of Optimus Prime". The Transformers. 1987-02-24. ^ "Sound waves Vs the Transformers cartoon". The Hub. Archived from the original on November 3, 2015. Retrieved 2007-02-16. ^ "GCD :: Covers :: The Transformers". www.comics.org. Retrieved 18 June 2018. ^ "Alignment". Transforce. Archived from the original on 2007-07-04. Retrieved 2007-02-22. ^ "Pilot (Part 1)". Beast Wars. Season 1. 1996-09-16. ^ Bob Forward (2003-08-12). Interview with writer Bob Forward (DVD). Rhino. ^ "The Agenda". Beast Wars. Season 2. March 11–13, 1997. ^ "Interview — IDWs Ryall & Furman Talk Beast Wars Comic". Comic News International. 2005-10-25. Archived from the original on 2006-10-30. Retrieved 2007-01-31. ^ "The Transformers Trilogy". Amazon.com. Retrieved 2007-02-27. ^ "Immediate Press Release — Dreamwave will be ceasing operations!". Seibertron. 2005-01-04. Retrieved 2007-01-31. ^ Benjamin Ong Pang Kean (2004-07-12). "Starting the beast war: dreamwave talks tformers: beast war". Newsarama. Archived from the original on 2007-09-26. Retrieved 2007-01-31. ^ "BotCon 2006 - Transformers Comics: Past, Present & Future". TFormers.com. 2006-09-30. Retrieved 2007-02-27. ^ "IDW's Plans For Transformers Revealed At The 2006 San Diego Comic Con". Comics News International. 2006-07-26. Archived from the original on 2007-09-27. Retrieved 2007-02-26. ^ "New Avengers/Transformers". IDW Publishing. Archived from the original on 2007-02-28. Retrieved 2007-02-26. ^ Jay (2007-03-02). "Stuart Moore Talks New Avengers/Transformers". Comics News International. Archived from the original on 2007-07-21. Retrieved 2007-03-03. ^ "Ryall answers fans' questions on TF/Avengers crossover". TFormers. 2007-02-26. Retrieved 2007-02-27. ^ Dave Richards (2007-02-24). "NYCC, DAY 2: MOORE, ROSEMANN AND RYALL TALK "NEW AVENGERS/ TRANSFORMERS"". Comic Book Resources. Retrieved 2007-02-27. ^ Whitbrook, James (June 19, 2018). "A New IDW Comic Is Mashing Up Star Trek and Transformers in the Most Glorious Way Possible". Gizmodo. ^ "Hasbro Cartoon Creation Panel". The Allspark. 2006-09-30. Retrieved 2007-02-04. ^ "Transformers Comics For April 2007 From IDW". Comics News International. 2007-01-08. Archived from the original on 2007-09-27. Retrieved 2007-02-02. ^ "Transformers". Box Office Mojo. Retrieved 2008-02-13. ^ "Hasbro Confirms The Transformers Cinematic Universe - Transformers 5 In 2017?". TFW2005. April 20, 2015. Retrieved April 21, 2015. ^ a b "'TRANSFORMERS' BACK TO TV". Wizard. 2007-06-25. Archived from the original on 2007-06-28. Retrieved 2007-06-26. ^ a b "Next TF Cartoon Series: "Transformers Heroes"?". Seibertron. 2006-09-02. Retrieved 2007-02-02. ^ Kelly Aherne (2007-06-25). "New Transformers Series Coming to Cartoon Network". IGN. Retrieved 2007-06-27.